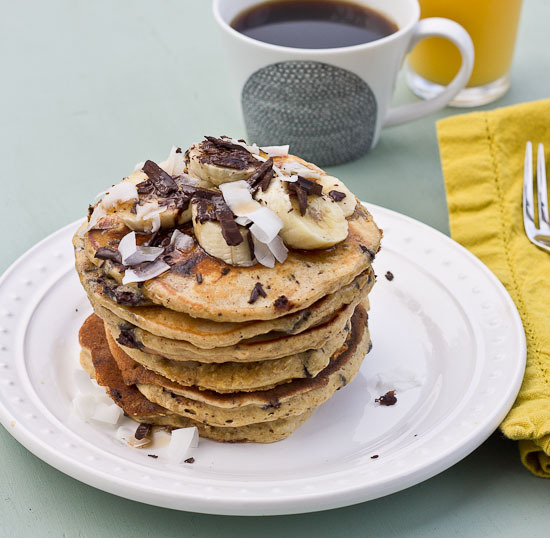 Shaved dark chocolate, smashed banana, coconut flakes, and coconut yogurt = Funky Monkey Pancakes. You will melt. It’s Monday and I don’t have my usual Meal Prep post this week because we are leaving on Wednesday for California. Have I ever told you that I have the BEST boss in the world? Tara invited Eric and I out to Disneyland for the Avengers race weekend… just for a vacay. Yep, she’s da best and I want to shout it to the rooftops! I’ve been in a pancake mood— in fact these little cakes were supposed to be apple cinnamon and then I saw Eric’s Liberte coconut yogurt in the fridge and I instantly became in the mood for coconut. Sorry honey. 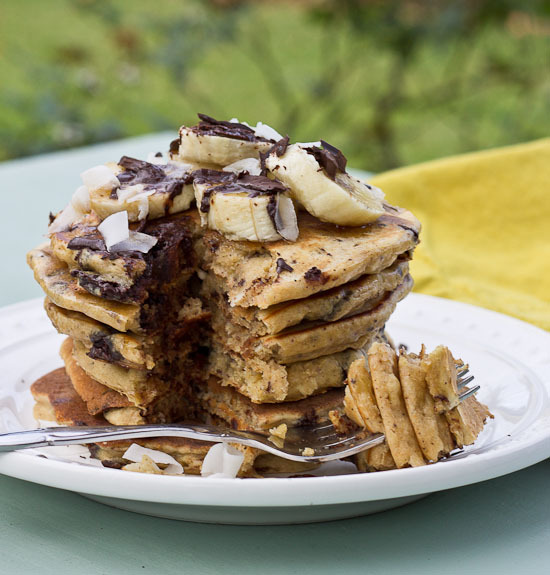 Then my brain started dreaming chocolate… which lead to bananas because chocolate is always better with bananas. THESE FUNKY MONKEY PANCAKES ARE LEGIT! I wouldn’t steer your wrong. Sack ’em up and top with maple syrup or melty peanut butter. Isn’t everything better with melty PB? 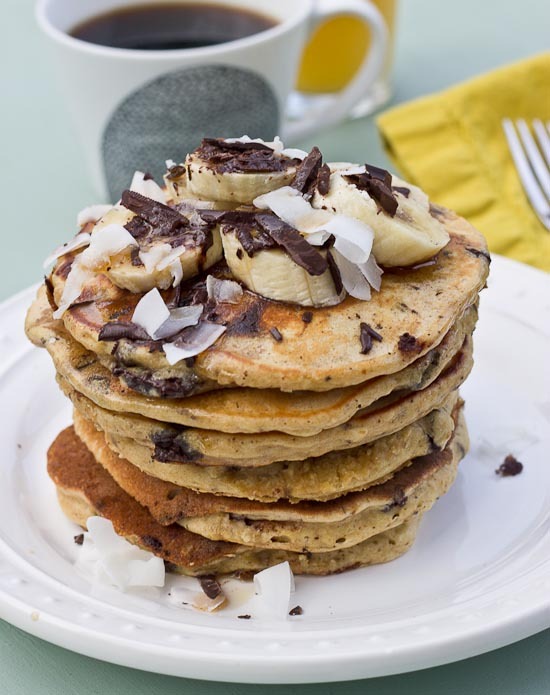 If you’re like to simply breakfast on weekdays– I know I do. Freeze these pancakes individually on parchment paper, then transfer them to a freeze safe plastic bag! 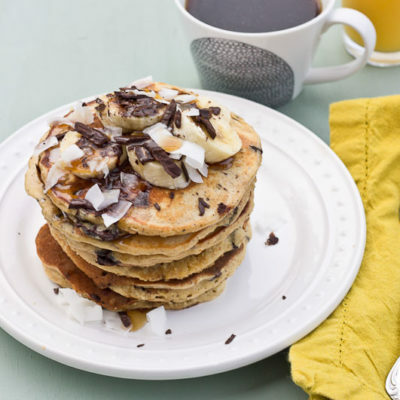 Reheat them in the microwave and you’ll have breakfast in minutes! Alright, hope you all are off to a great start to your week! See you tomorrow. In large bowl, whisk together flours, baking soda, salt, brown sugar. In separate bowl, whisk together eggs, yogurt, and milk. Pour liquids into flour and stir to combine. 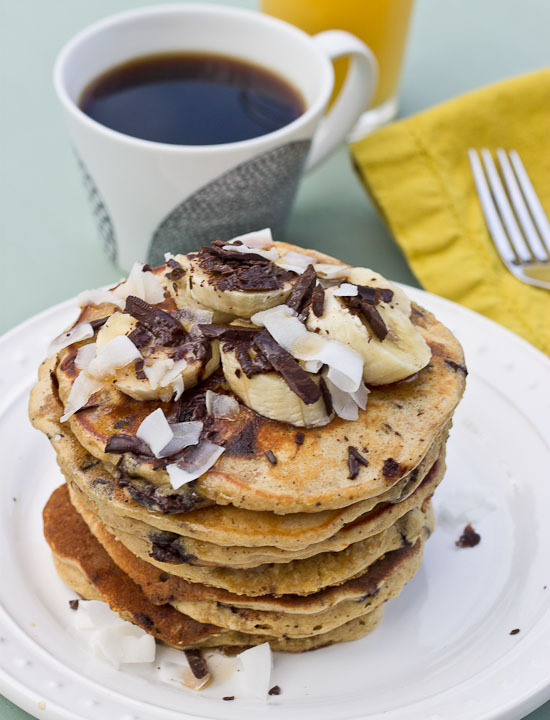 Stir in coconut flakes, banana, and chocolate chips until incorporated. Lightly grease non stick griddle with butter and heat over medium heat. Pour 1/4 cup batter and spread pancake out to form uniform circle. Once bubbles appear on surface of pancake and side begins to turn golden, flip. these look like pure heaven! yum! I’m not a coconut fan, but will totally be trying these! They look delicious & have monkey in the name, who could go wrong? THANK YOU! 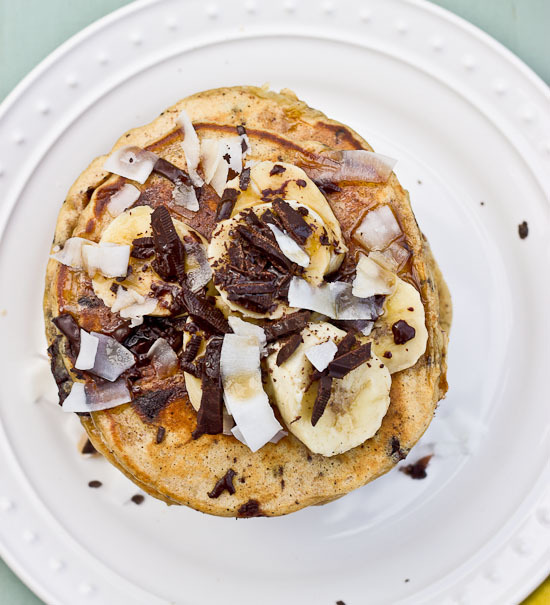 You could easily use vanilla Greek yogurt and omit the coconut! These are right up my alley- they look amazing. Thanks Rebecca 🙂 I had fun with them!